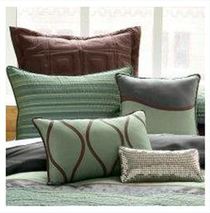 Pillow Décor has traveled the world to find beautiful pillows and original designs. We are pleased to offer this exquisite treasure in the form of a beaded velvet pillow. Beads, sequins and embroidery combine to form a glamorous central medallion in the form of a Christmas tree. The almost iridescent orange velvet is the perfect background for this fine bead work. Dress your home for the holidays or add year round luxury to your space with this exclusive design.